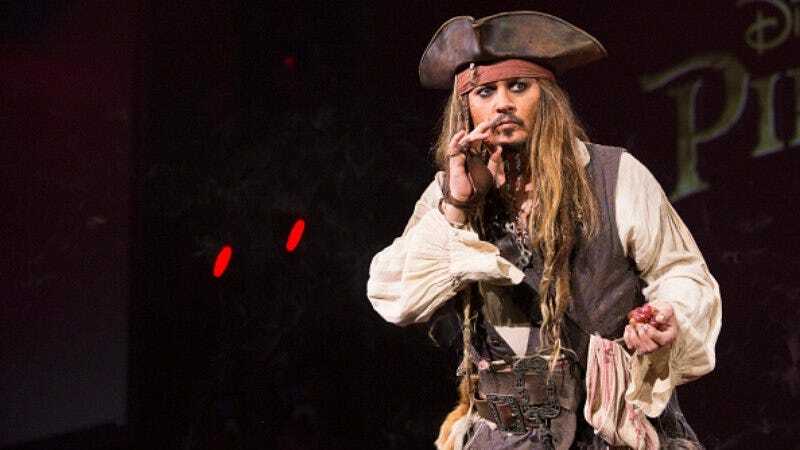 The people aboard Disneyland’s Pirates Of The Caribbean ride were treated to some extra spectacle the other day, when Johnny Depp—who stars in the movies inspired by said ride—showed up dressed in character as Jack Sparrow. According to CNN, the actor just popped up on stage at one point, complete with pirate hat, eyeliner, and cutlass. Some of the passholders say they were tipped off to something happening by the fact that Disney was actually filming their ride, but the riders got their own footage of Depp’s prancing and slurring. There’s a new Pirates movie on the horizon, which is presumably why Disney procured Depp’s involvement (who probably has some financial incentive of his own to keep the studio happy). Depp apparently wanted the people in the boat to jump in the water so he could have it all to himself, but no one was so enthralled that they actually complied, which is good because that could have gotten ugly.